A brighter, shinier hair color can make you feel like a million bucks. Not only does it transform your appearance, it also lifts your spirits and rejuvenates the self-image. When you walk out of the hair salon, you know you look good. About two weeks go by, however, and you notice the luster in your hair has faded to lackluster. Somehow, it looks less natural and feels a little brittle. Soon you are right back in the hairdresser's chair, getting your hair colored again. "The use of hair color has increaced 1000 percent over the last 10 years," says Ted Cortese, colorist and owner of diVa colour studio in East Memphis. "Obviously, there's a great need to keep colored hair looking better, longer." Hair that has been chemically altered or "enhanced" as many client like to say, lasts about six to eight weeks after its application, says Cortese. Although it's impossible to prevent fading, he recommends two "tricks" to help slow down the unnatural faded look. First, retain moisture and those sparkling highlights by using less heat to blow-dry your hair. Airflow that's too hot will rob hair of its bound moisture. If your dryer is too hot to blow directly on your neck, it's too hot to blow on your hair. Turn down the heat, Cortese says, and you will see "dramatic" inprovement in the look and feel of your hair within a couple of days. "Hot air should be used only for the final steps of styling with a round brush or the styling brush of your choice," he says. 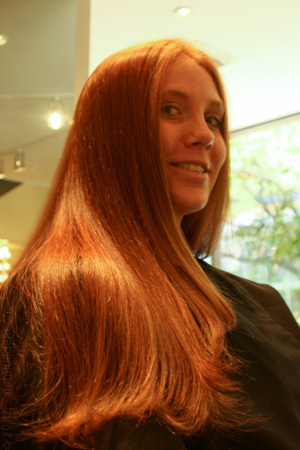 Second, switch to shampoos, conditioners and other hair-care products especially formulated for color-treated hair. "Another cause of dry, brittle fading is the use of chemicals used for the process," says Cortese. "New shampoos on the market help solve the problem by using natural fruit-and grain acids, which, along with natural antioxidants, help remove the damaging effects of the hair coloring process," he adds. Improved conditioners for color-treated hair also help counteract any potentially damaging effects. "The bottom line," says Cortese, "is the superior technology of some shampoos and conditioners absolutely make hair feel softer and give it more body with an abundance of shine".